Germination cabinets are not very common, but they should be. Simply put, a germination cabinet is any chamber which creates the ideal conditions for germination and initial growth. Where we’ve already discussed various heat sources which can stimulate germination, heat isn’t the only thing needed for a plant’s first few weeks of life. Some growers are either working with extremely fussy crops, or the grower’s local microclimate isn’t well suited to growing those crops. Or both. Under those circumstances, providing heat is necessary but not sufficient. Providing ideal humidity, light and sometimes even intelligent use of space, can make the difference between valuable crops limping along, or surging ahead. What is a germination cabinet, and when is it used? First, the cabinet must at least provide heat before germination can occur. That heat can be provided via soil heating cables, heating pads, radiators or a heated reservoir of water. The former might sound like a much simpler option than the latter, but the latter actually also provides the second need: humidity. Humidity is another requirement for most seeds. Most growers would think of that as keeping the soil or growing medium adequately moist, and leave it at that. But relative humidity can make that task easier or more difficult. When the relative humidity around a seedling is too low, moisture can be sucked out of that growing medium surprisingly fast. On the other hand, if humidity is too high, damping off disease can lay waste to whatever you might plant regardless of how much drainage you offer those seedlings. Creating a controlled environment to keep those humidity levels near ideal levels might take more effort up front, but it results in better performance over time. Light is not a requirement for most germination, but it is definitely a requirement once the seedlings break the surface. When heat is provided, that germination can occur extremely quickly, sometimes faster than we can keep up with. By setting up and providing adequate lighting not only for germination but also for the first few weeks, those plants can get a solid start while the grower is free to work on other tasks, or free up other growing areas. Many different growing methods can provide those first three requirements. But one thing unique to germination cabinets is the fourth design principle - intelligent use of space. Hot and cold frames, hoophouses and greenhouses, almost all use only one level of growing area, namely the soil at ground level, or seedling trays set on the ground. Some hoophouses and greenhouses are set up with benches or baskets in addition to the existing soil, thus increasing the growing area by perhaps another 50%. Germination cabinets, on the other hand, usually offer multiple shelves for growing space, which dramatically increases the growing area within a very small footprint. One additional, optional feature which some folks use very effectively is a CO2 supply, for two reasons. First, the cabinet is wonderful at containing heat and light and humidity, but that lack of air exchange with the outside world does come at a cost - the young plants will use up CO2 very quickly And CO2 has been called "the missing link" in a variety of controlled-atmosphere growing situations, such as those found in closed hoophouses or greenhouses. Since plants use CO2 the way we use oxygen, any drop in the concentrations of CO2 will have considerable impact on plant metabolism. Simply ensuring that CO2 levels stay at normal atmospheric concentrations of roughly 300ppm will ensure this "nutrient" doesn't become a deficiency. But possibly most importantly, CO2 concentrations have not always been at 300ppm in our atmosphere. Earlier geological eras featured CO2 at much greater concentrations - as high as 1500ppm. Interestingly, most deciduous plants can still do very well, even thrive, in those much higher CO2 concentrations. Much like people can do very well in rich oxygen environments. Normally, CO2 supplementation isn't cost effective when working with a large volume of air like hoophouses or greenhouses. But in the close quarters of a germination cabinet, CO2 supplementation is much easier, and will have much greater impact. It's not necessary if passive venting is otherwise provided to the cabinet. But it's an opportunity to further boost growth if the grower so chooses. As we’ve started to hint above, germination cabinets offer some unique benefits. First is the issue of space. Growers are often in a pinch at the start of the growing season, because they don’t have enough space for all the needed seedling trays. Growers must choose what to plant first, then wait for space to open up before planting another round of trays. Worse, that staggered planting schedule can sometimes result in delayed products for the table or the market. Yet germination cabinets offer a way for growers to plant a tremendous number of trays early in the season, and ensure that all of them get the environment they need. Secondly, the ability to provide light and humidity, in addition to the heat, can be a substantial advantage over other forms of season extension. Hot and cold frames, hoophouses and soil heating methods are most commonly used early enough in the season that ambient light and humidity levels are far from optimum. Providing 14 hours of light a day, and moderate amounts of humidity, can boost growth, cut losses to damping off and other seedling diseases, and get seedlings ready for transplant much faster than via extra heat alone. Third, the germination chamber allows us to capture and hold every last bit of heat we’ve worked so hard to create. As we discussed on the soil heating cables page, the grower runs the risk of losing a great amount of heat into the soil if the planting area aren’t insulated. Even if the planting area is insulated, the ground still radiates that heat back into the atmosphere. The germination chamber, on the other hand, is much less prone to leaking heat if it is even moderately insulated. That’s because air is a natural insulator, and the cabinet is typically surrounded by air on all sides. Furthermore, the materials for the cabinet walls are often insulative in their own right, and further reduce heat loss. Whatever heating system is used within the germination cabinet, that heat source is almost certain to cost less to maintain than using the same heat source in an exposed or even partially insulated alternative. If using electricity for heating mats or heating cables, the savings can be considerable. And fourth, germination cabinets offer most (if not all) of the same advantages as hoophouses or even full-service greenhouses during the first few weeks of seedling life, at a dramatically reduced cost. Because the cabinet makes such efficient use of space, the materials savings alone can be more considerable as compared to a hoophouse or greenhouse. For instance, one farm I worked at had an 8x10 fiberglass greenhouse, complete with heat, light, ventilation and water service. That small house provided the seedlings with their start in life. There were two main benches in the house, along with two smaller shelves above the main benches. The footprint of that seedling house was 80sqft. The shelves and benches provided an actual growing area of only 50 square feet. The purchase price for that house was approximately $4000. Very close to the same growing area could be obtained by a germination cabinet that was 4’ wide by 2.5” deep, with six shelves in it. Each shelf would be 48” wide by 24” deep, thus allowing for 10 square feet in size. The shelves would not quite fill the full cabinet depth; the extra cabinet depth would allow for the passage of wires for the heating and lighting, while also helping to circulate the air. Anyone with decent carpentry skills could assemble this cabinet and fully stock it with heat mats and small fluorescent lights for less than $1000. Possibly a lot less if they shopped first for good deals on the assembly materials. The operational costs would be dramatically less because less heat would be needed to maintain the desired temperature, and those plants would emerge into plenty of light. More benefits than other season extenders at a fraction of the cost. Germination cabinets, like everything else, do have a few disadvantages. First, they generally aren’t available for purchase, which means a grower needs to construct their own. I have seen something similar in home improvement centers, consisting of a tall set of freestanding shelves covered by a close-fitting, clear vinyl jacket. These could be considered a good start for a germination cabinet, but it’s not quite the same. These generally have fixed shelves, which may or may not correspond to the number of shelves needed. Second, the shelves are often not very wide, and again may not meet the grower’s needs. I often also wonder how durable those shelves are, after being loaded down with fully loaded seedling trays. They may or may not stand up to hard, repetitive use. Those cabinets also don’t have any internal provision for heat cables, heat mats or lighting; the only heat and light comes passively through the vinyl much like it would through a hoophouse film. Most of the cabinets used by the commercial growers I know of are homemade, to the grower’s specs, sized to provide exactly the amount of space that grower needs. They are also wired to provide for lights underneath each shelf, and each shelf typically has heat mats and/or a heater at the base. They are often on wheels so that the grower can move them from place to place as needed. And the cabinets I’ve seen are built for years of reliable service. But that robust cabinet needs to be designed and constructed by the grower, in addition to everything else going on, and that can be a stumbling block for busy growers already trying to tackle too many projects at any given time. Once this initial obstacle of time, money and effort is overcome, all the advantages listed above kick in. Another disadvantage isn’t really a disadvantage as much as an obligation. When a new tool is set loose on the farm, sometimes that’s becomes a mixed blessing. It allows growers to do a single task which then obligates then to do a whole chain of followup tasks in order to make the most of the entire sequence. What is that in plain English? If we have the ability to germinate and sprout peppers on New Year’s Day, such that they’re 2” tall six weeks later, that ability doesn’t do us any good unless we can then plant them somewhere safe and sound on Valentine’s Day. Which then becomes a new “task” for growers on top of everything else to be done in late winter. Building the germination cabinet is relatively easy. Building the rest of the support infrastructure to make those plants happy for the rest of the at-risk early growing season is a much bigger responsibility. If growers are willing to take on that entire process, and can do so cost effectively, then the germination cabinet is a worthwhile addition. If the rest of those pieces cannot reasonably be provided, it’s not. Germination cabinets are primarily used, as implied above, to get high-value and/or tender seedlings going as early in the year as possible. Typically, the most likely candidates for starting in germination cabinets are those that take the longest to get going, those which need a longer growing season than is typically available in that location, and/or those which are fragile and unusually prone to the risks of early-season stressors. Some growers I’ve talked to with germination cabinets use their cabinets for peppers, corn, eggplant, squash, tomatoes, melons, basil and other tender herbs. The biggest task when using the germination cabinet is to figure out the ideal light, heat and humidity your seedlings need in advance, and make sure the germination cabinet is set up to provide it. Happily, most seedlings need these three in fairly similar ranges - soil zone temps between 50-65F (with some seeds needing slightly higher temps), relative humidity in the range of 40-60%, and good strong light for 14hours per day. 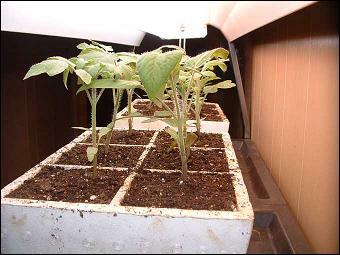 These three criteria can be provided via soil heating mats set at the correct temperature, a tray of water at the base of the germination cabinet which is warm enough to put water vapor into the cabinet air, and either fluorescent tubes or LED lights under each shelf to provide light to the shelf below. Two additional features which help a great deal are small fans to keep the air moving around in the cabinet, and a CO2 tank to pipe CO2 into the cabinet once the seedlings are respirating. Once these features are set up and running, a grower would be well advised to let the unit run for a few days, then set dummy seedling trays inside and monitor the cabinet for a few more days to ensure those parameters are stable. Once the cabinet is up and running and holding those parameters within target ranges, the actual crop seeds are planted in seedling trays much like they would be otherwise. The trays are then placed in the germination cabinet just as they would be placed on the heating pads in a hoophouse. Growout time will vary according to each plant, but be prepared for slightly faster growout and have their next homes ready before necessary. Germination cabinets can hold seedlings for a short time, particularly if CO2 is piped in, but even those ideal conditions will eventually create a plant that’s too tall for its location in the cabinet. We haven’t built our own full-sized germination chamber yet, but we have worked with smaller-scale enclosed containers, suitable for 1-4 seedling trays at a time. I was pleased enough with those results to look forward to build a full-sized cabinet as described above. I’ve talked to those who have cabinets very similar to those described above, and I’m fairly envious. The advantages are considerable. The main reason we haven’t moved forward on this project is precisely because of the “rest of the process” disadvantage I mentioned earlier. We can very easily build the cabinet/ but we’re not yet set up with the rest of the infrastructure we’d need to move those strong young early plants into suitable housing after they left the cabinet. As much as I love the idea, I need to have the rest of those pieces in place first. The vast majority of growers who use germination cabinets are using homemade units. While researching this article I did find that some companies offer premade germination cabinets, which surprised me. They offer all the features of the homemade units - lights, heat, and humidity. I did not happen to notice any that offered CO2 supplementation, but I didn’t look too closely. I was instead put off by the stainless steel, heavy industrial appearance of the units. In a word, they seemed overbuilt. Perhaps they would be appropriate for use by university researchers who need those more exacting standards and heavy-duty chassis for classroom and lab use. Or growers who are breeding their own varieties and need sterile conditions between each batch, along with year-round ruggedness. Perhaps if I won Lotto and had already purchased all the other items on my wish list, I’d get one just to experiment with it. But not otherwise. At the other end of the spectrum are used cabinets of all makes and forms, which have been “re-purposed” for their new task as germination cabinets. These are a lot more common. Kitchen cabinets, metal utility cabinets, molded plastic yard storage cabinets, freestanding shelves, even toy bins and old refrigerators or freezers have been resurrected for use as germination cabinets. I’m always amazed and impressed by farmers’ and gardeners’ thriftiness. If you like the idea of the germination cabinet and already have one of these cabinets not serving any particular purpose, you can probably retrofit it to serve admirably for a fraction of the cost of buying new or even building with new materials. For those of us not quite fortunate enough to have a spare cabinet of just the right size, and who don’t want to spend money on the high dollar units, it’s relatively straightforward to construct a workable cabinet out of plywood, reinforcing dimension lumber such as 2x2’s, and sufficient hardware for doors, vents, and castor wheels if the unit is to be portable. While it works best to have insulation around all six surfaces, that may or may not be worth the hassle. And a see-through door can be very convenient even though light is available above each shelf; that see-through feature can be a nice reminder to check the contents every day. A non see-through door would be too easy to walk past without notice.